I wonder what the strategic importance of this bridge was that they were allowed to use steel for it during World War II. The City of Chester contracted with Sverdrup & Parcel, Consulting Engineers, of St. Louis, Missouri, in 1939 to design the bridge. 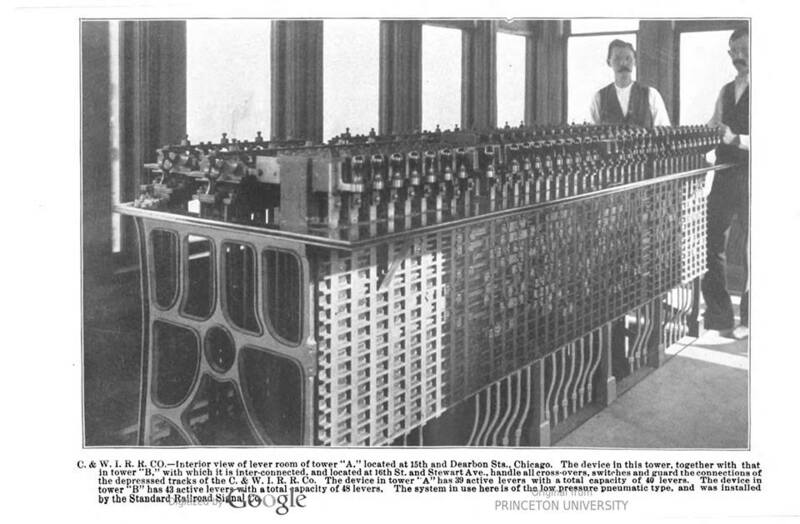 Bonds were sold to finance the construction and the first contract for construction was awarded in July 1939. 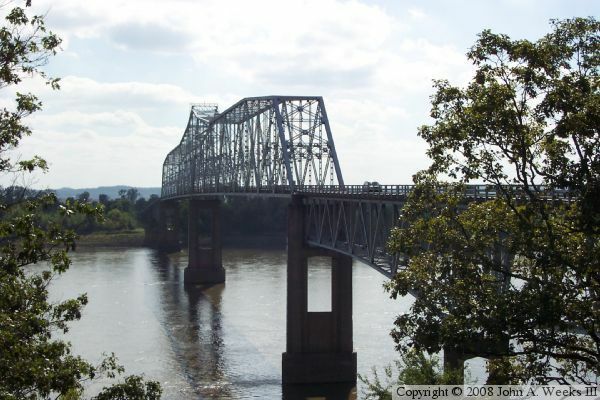 The Massman Construction Company of Kansas City, Missouri was awarded the contract to build the bridge. 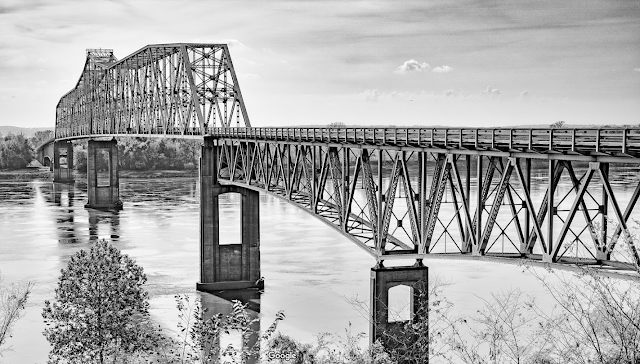 The steelwork was done by the American Bridge Company of East St. Louis, Illinois. 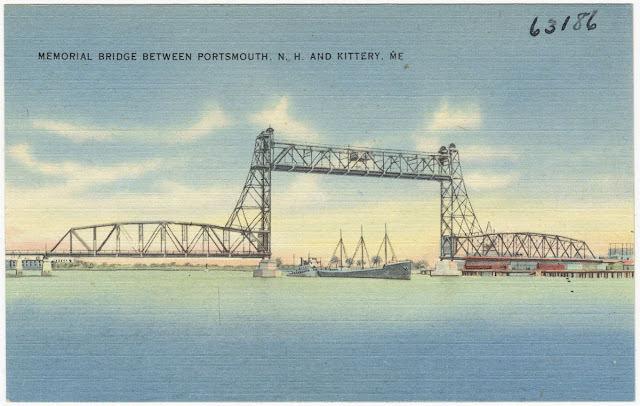 The bridge was completed in May 1942, and work on highway approaches was completed over the summer of 1942. 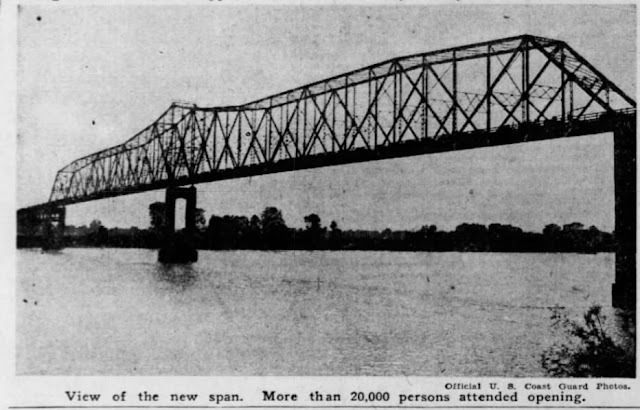 The bridge was dedicated on August 23, 1942. 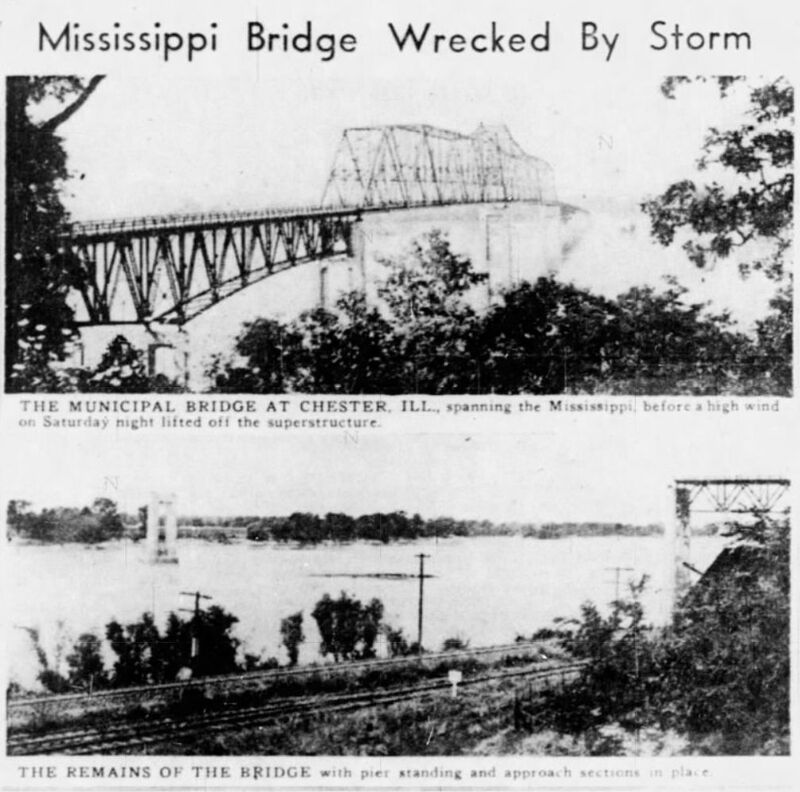 During the evening of July 29, 1944 a strong windstorm, possibly a tornado, struck the bridge and the two main spans were destroyed. Reconstruction and repair of the bridge took two years to complete and the bridge was reopened on August 24, 1946. The bridge operated as a toll bridge until December 31, 1988. 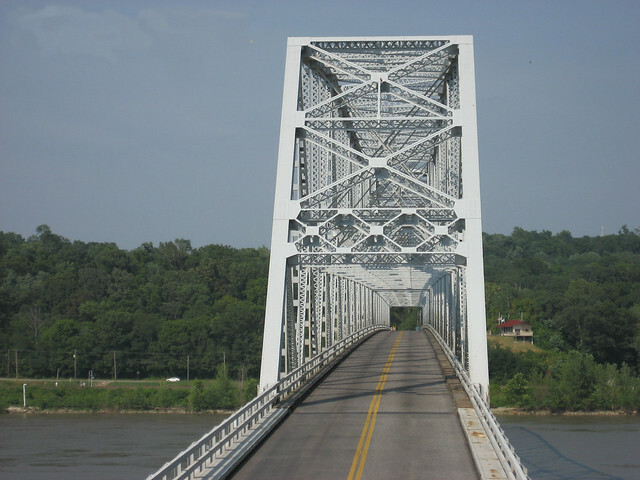 The Departments of Transportation in Missouri and Illinois jointly own and maintain the bridge. The bridge is eligible for the National Register of Historic Places under criteria C for local significance in engineering. 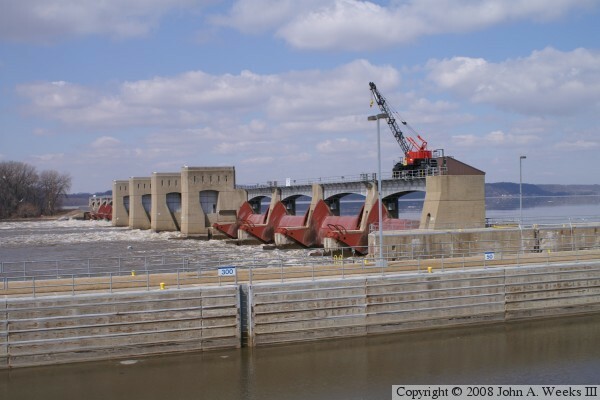 The bridge is an excellent example of large scale bridge engineering required for major river crossings. 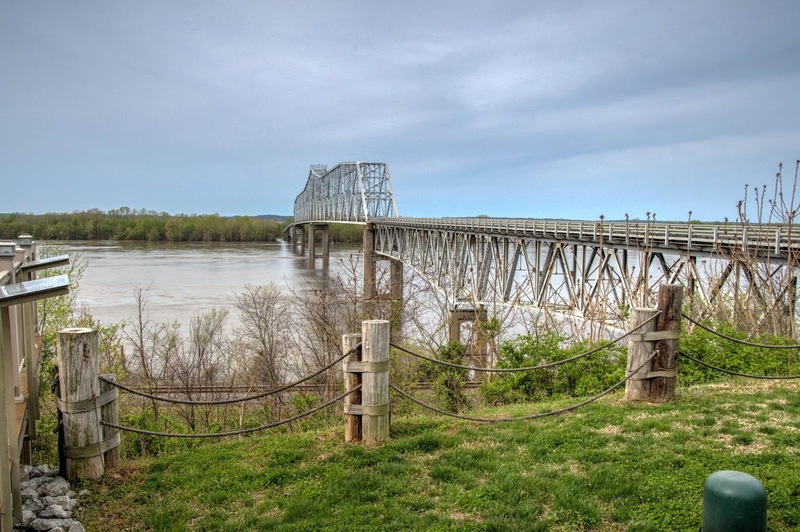 MoDOT’s Historic Preservation Section is now accepting proposals for the relocation and reuse of the bridge or its components until December 31, 2018. 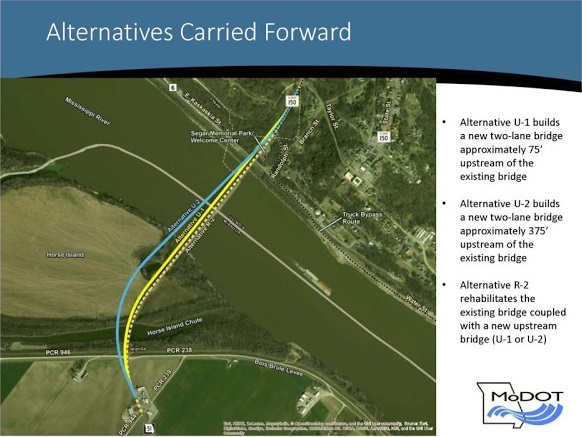 A proposal checklist is available MoDOT’s Free Bridges website (http://www.modot.org/freebridges/). Preservation covenants may accompany the bridge. Several people have contributed detailed shots of the bridge in Bridge Hunter because MoDOT wants to get rid of this truss as well. [RandolfCountyHeraldTribune-2016]. 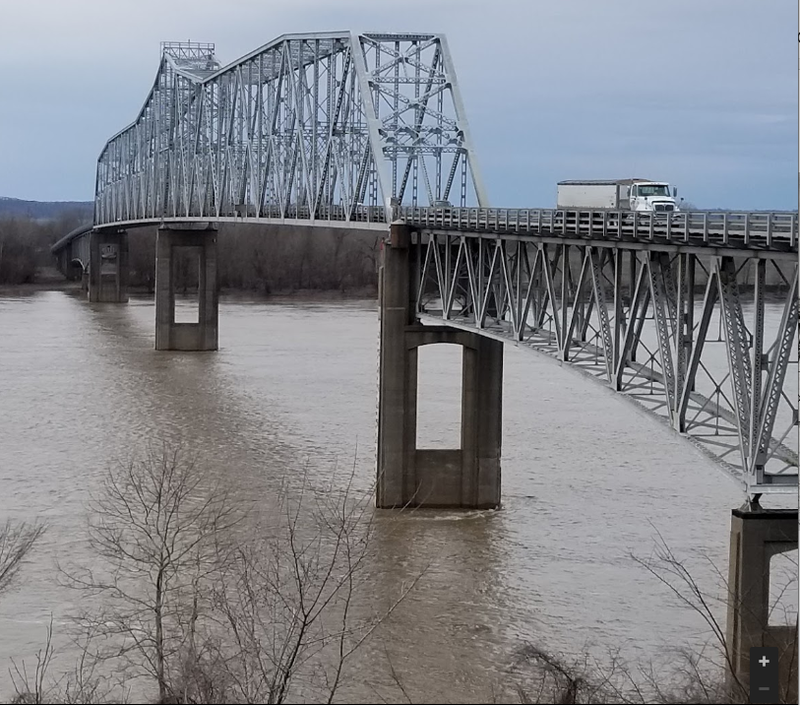 "The bridge - the only Mississippi River crossing for car traffic between Cape Girardeau and south St. Louis - is also a tourist attraction as much as it is a transportation asset." [RandolfCountyHeraldTribune-2016] To be fair to the DOTs, sand blasting and painting the insides of all those built-up, V-laced truss members has to be time consuming. See below for the results of the study that was going to start in 2016. 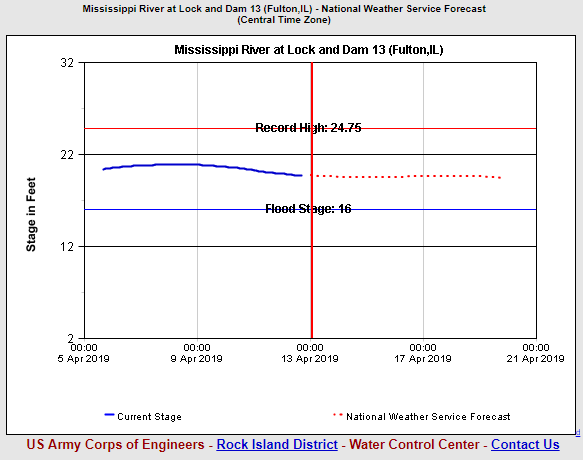 This photo during the Flood of 2019 is what motivated this post. 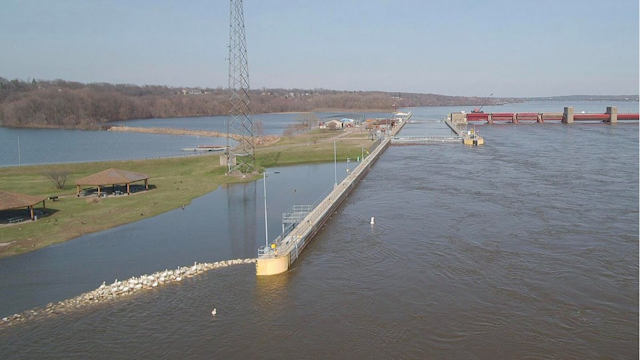 In Tim's photo, the water is almost to the base of the columns. Below, John caught the bridge with a low river level allowing us to see how much of the piers is covered in Tim's photo. The above photo was cropped from this one. I couldn't find the boat launch from which the photo was taken. Then I noticed that Water Street literally had water on it! 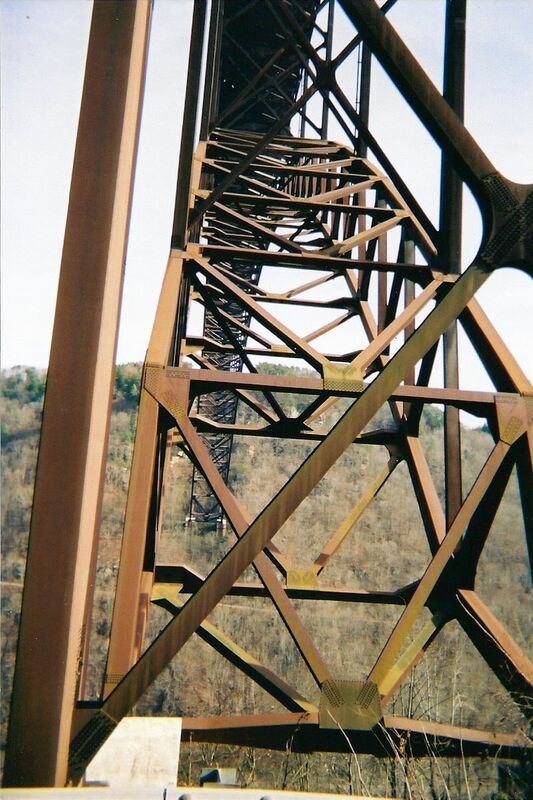 It looks like they got another allocation of steel during WWII so that they could rebuild the truss. As promised, the results of the study. The study includes a couple of nice photos of the existing bridge. 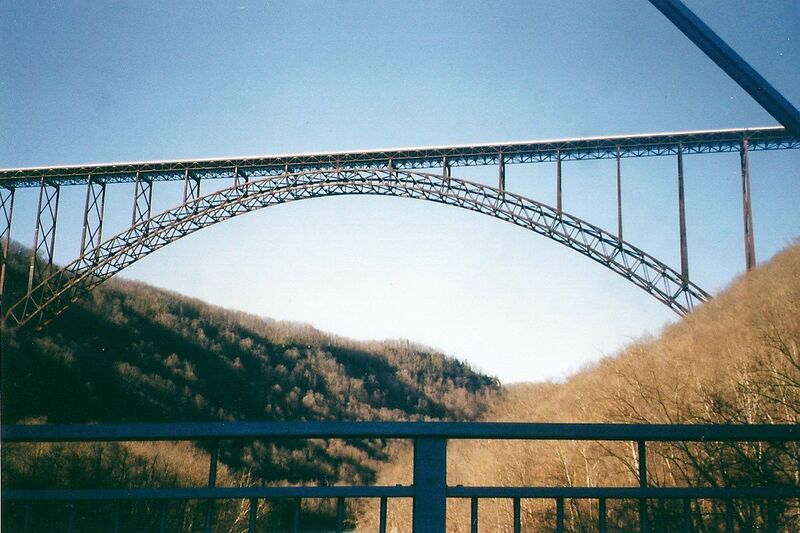 Or as nice as you can get with a blue bridge against a blue sky. Again, notice how the 18-wheelers appear to be so small. 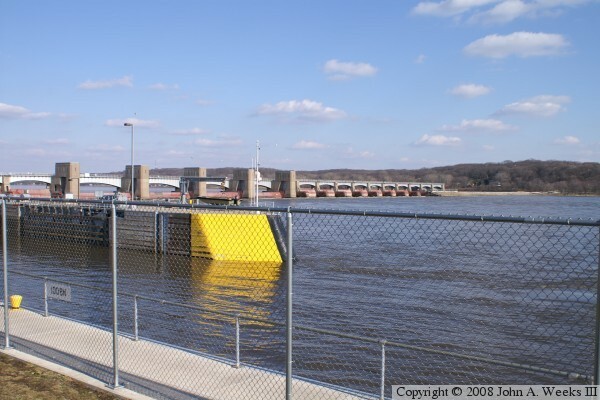 This photo is a reminder that this bridge is downstream from St. Louis so there are no locks to worry about. Thus the tows can get really big. I noticed the soggy green channel west of the bridge. So I zoomed out some. 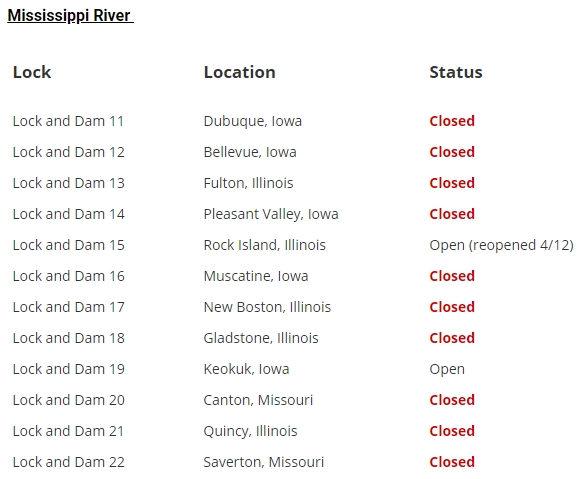 Sure enough, that used to be were the river went. Note where the state line runs. 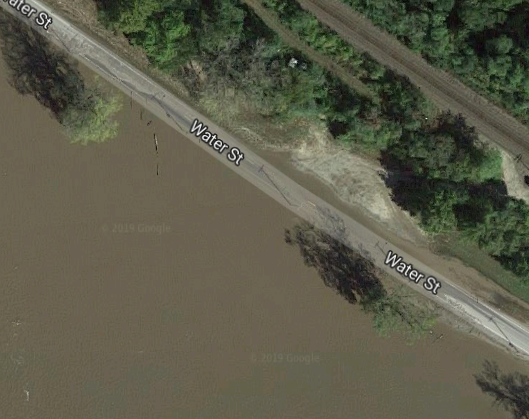 Remember that this satellite image was captured when the river was high. To see what the river normally looks like, I fired up Global Earth. Most of the images have the white sandbar. 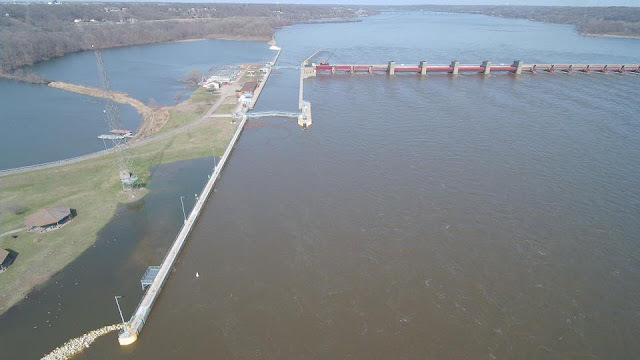 In this image, there is no water on the east side and in the old river bed. I include both the time control slider at the top and the image capture date at the bottom to record that they disagree. I'm going to have to pay more attention to the image date in the future when I use this tool. 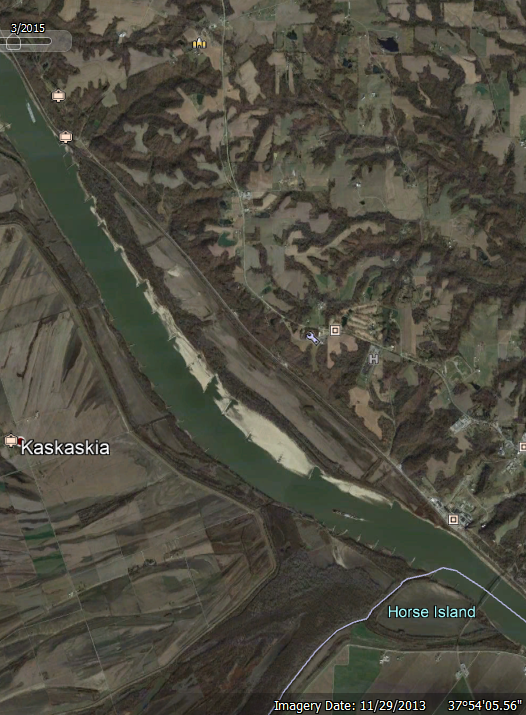 When I noticed the name Kaskaskia on the satellite map, I zoomed in to see what is there. Not much. This is the first time I have seen so many houses removed from a town grid that they now till the blocks. 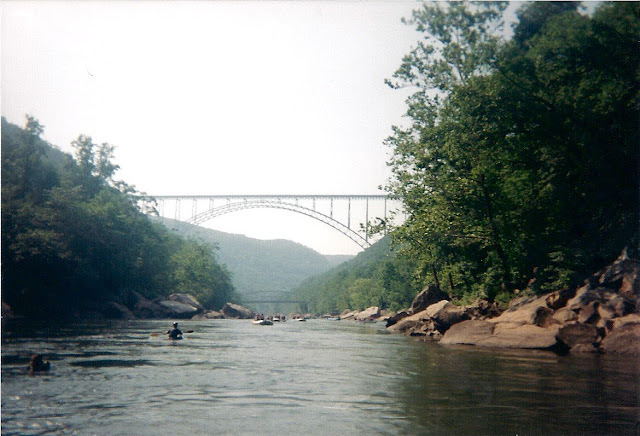 Once again, John Weeks III talks about more things than just the bridge. Chester is the home town of Elzie Crisler Segar, the cartoonist who created ‘Popeye The Sailor Man’. 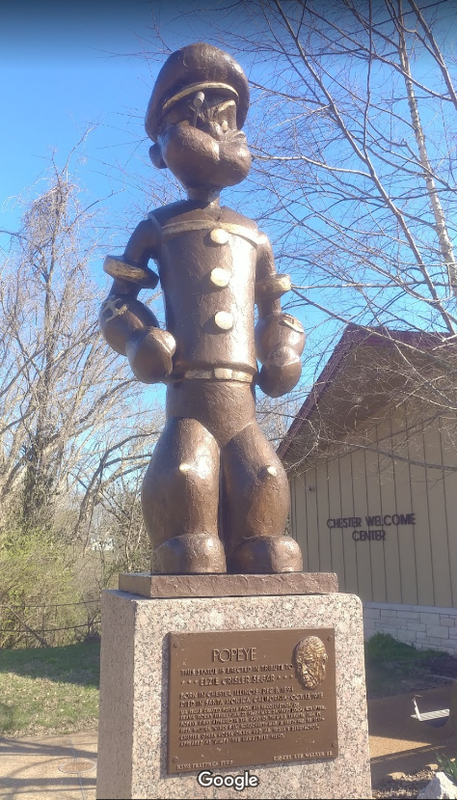 There is a small park on the Illinois side of the crossing to remember Segar, which includes a life-sized statue of Popeye. The city celebrates Segar in the annual Popeye Festival held each labor day weekend. 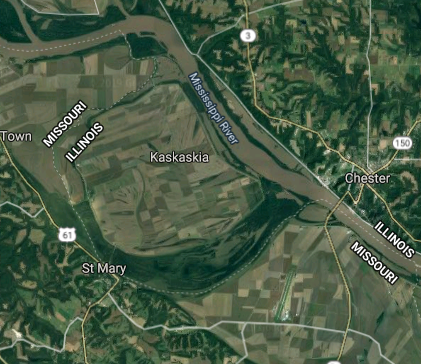 The village of Kaskaskia is located on the west side of the Mississippi River just upriver of Chester. 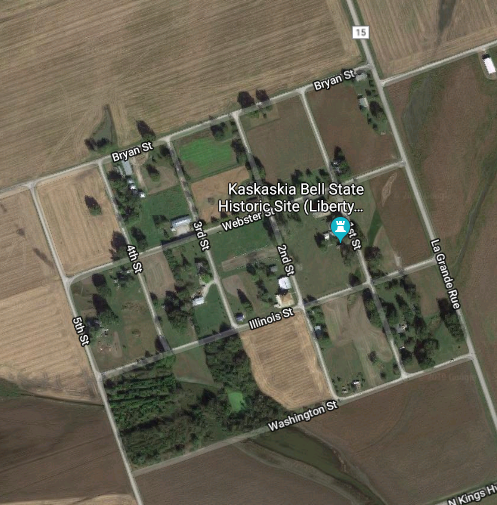 Kaskaskia was a commercial and transportation hub in the 1800s. 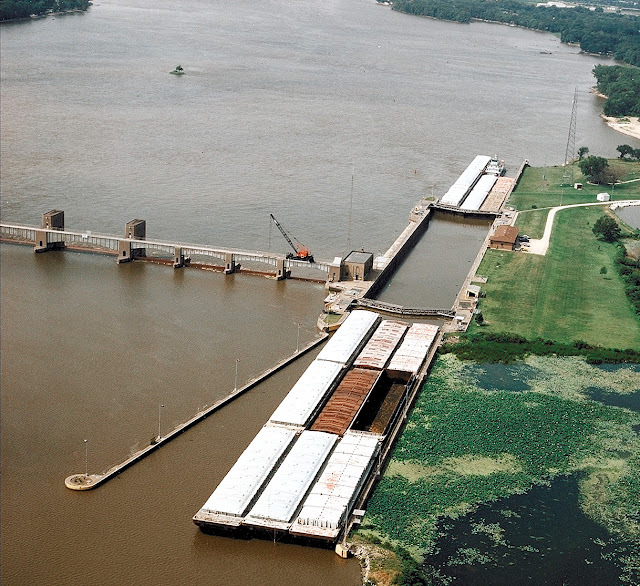 In fact, it was the first capital of Illinois until 1820. 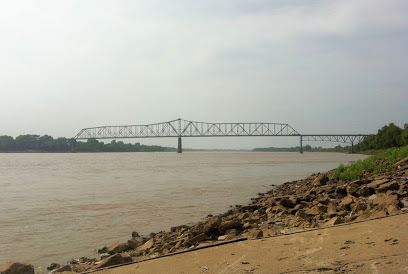 The Mississippi River shifted course to the east side of Kaskaskia in the middle and late 1800s. 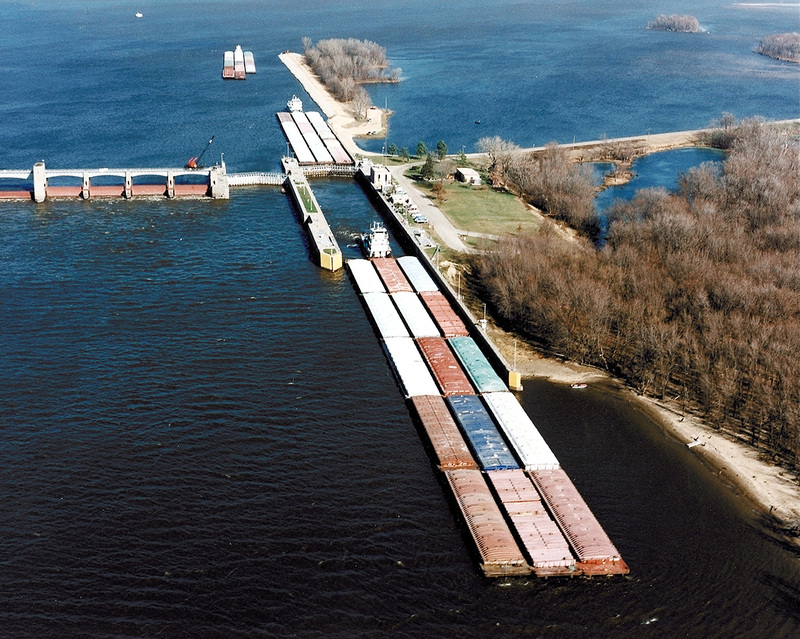 As a result, the village is now located on the west side of the Mississippi River. 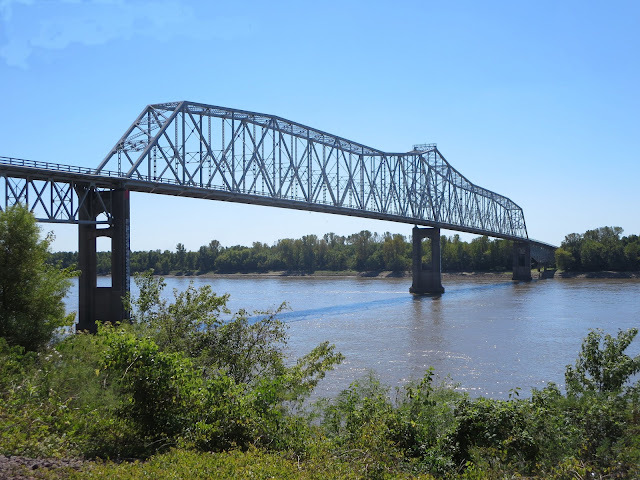 But since the state line follows the historic path of the Mississippi River, Kaskaskia remains a part of the state of Illinois. The fortunes of Kaskaskia started to wane following the shifting of the river. Its population steadily declined throughout the 1900s with only 9 people remaining in 2000. 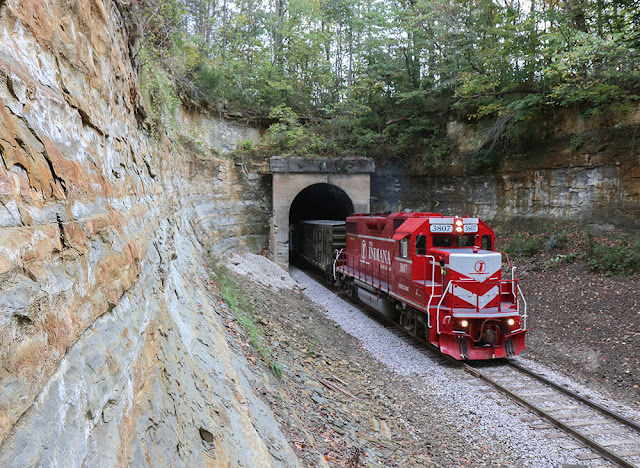 INRD 3807 (GP38-2) leads INRD O-SASA through the short tunnel in Unionville, Indiana. The old tunnel is a hidden and mostly unknown part of the area that gets overlooked by the Tulip Trestle and Shuffle Creek Viaduct but is definitely worth the hike to get down to it. The 15th Street Tower was part of C&WI's route between 21st Street Crossing and Roosevelt Road, which as the route to Dearborn Station. Bob Lalich Interesting trackwork in the foreground! Dave Durham Bob Lalich I agree. Its great to be able to see all of this trackwork as it looked at that time. Lots of respect for the old-time railroaders and their tenacity. Dennis DeBruler Finally, a good photo of C&WI's 15th Street Tower. The few photos I have seen so far always had a train in front of it. 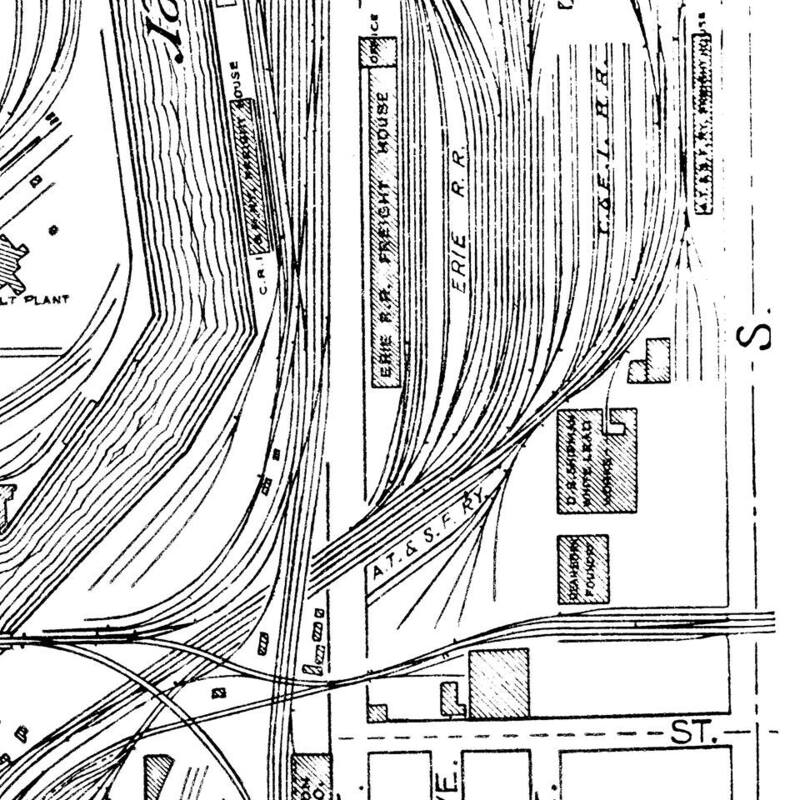 The five tracks that went to Dearborn Station are on the other side of the tower. The tracks leaving the frame in the lower-right corner went to the freight houses of some of the C&WI owners and Santa Fe. That track going across the front is raising a lot of questions in my mind. I don't see any gaps in the rails that cross it. So is it obsolete and they just cut through it? If it is obsolete, why didn't they just remove it? 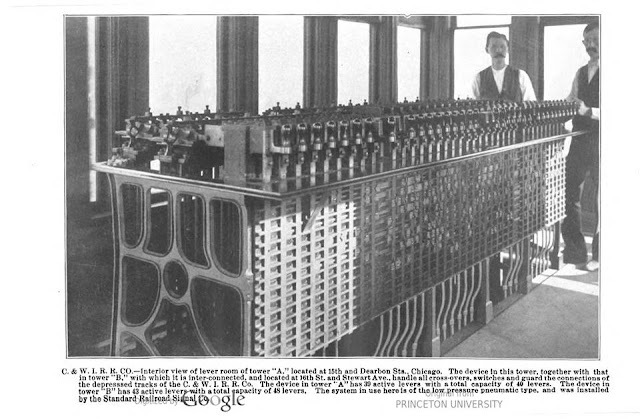 How did they cut rail back then? A big hacksaw? Now they use a cutoff wheel with hydraulic power from a service truck. I wondered about those rails as well Dennis. I'm not sure what to make of them. Here is a crop of the Smoke Abatement book map of the area. 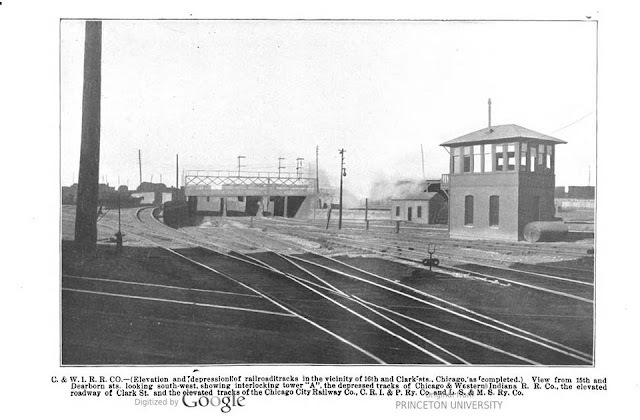 It shows that there was a white lead plant and foundry next to the tracks. That may offer some clue. Bob Lalich In later years the towers north and south of the NYC/Rock Island viaduct were called 15th St and 16th St respectively. 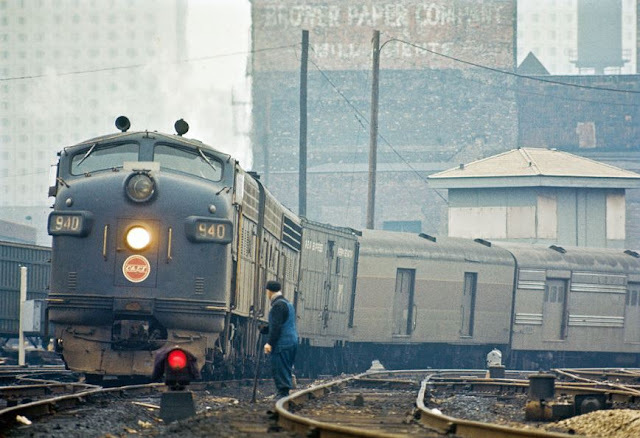 Two Grand Trunk Western EMD GP9's at 14th Street on the Chicago & Western Indiana tracks with The Maple Leaf - June, 1967. 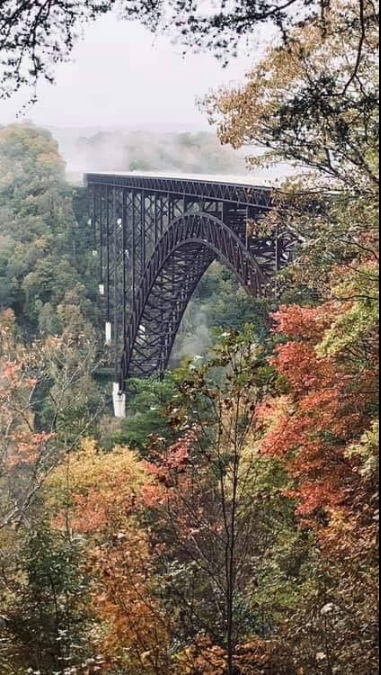 Dennis DeBruler There is a tower peaking above the train near its end. I need to study some maps to see if that is the C&WI 15th Street Tower. I've seen very few photos of it. Stan Stanovich ...because of it proximity Mr. Dennis DeBruler, I would dare say it’s the tower at 16th and Clark!! !Bob Lalich Yes, that is 15th St tower near the right edge of the photo. It was closed by this time. I'll double check but I believe 15th St was remotely controlled from the "new" Roosevelt Road tower when it was built in 1964. 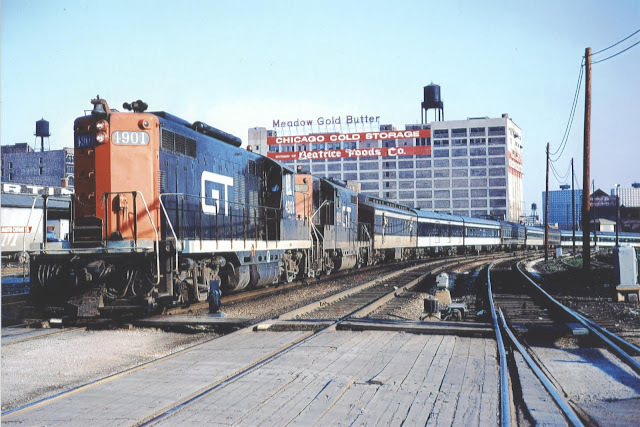 According to the late Ray Curl, C&EI historian, the Georgian's last run was January 30, 1968, thus ending through Dixie-line service via the L&N at Evansville and other southern lines. The bridge carries US-19. 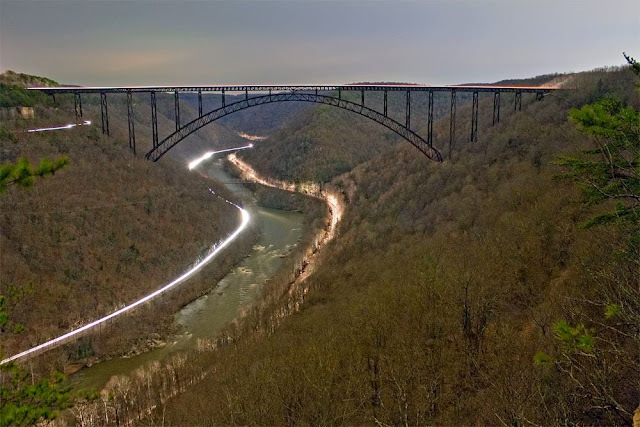 But I added the rrCaO label because CSX has routes along both sides of the river. Doug Mangold some days you can walk across the bottom of it! And they close it for base jumping one day a year.Christopher Magargle I thought that base-jumping was canceled after a fatal accident years ago ? A late friend of mine who was from West Virginia said they would close the bridge one day a year for bungee jumping. 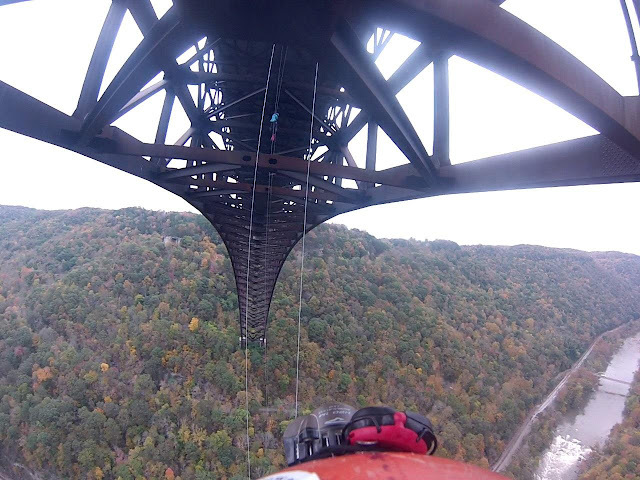 A comment I read indicated they also did base jumping until some one got killed. 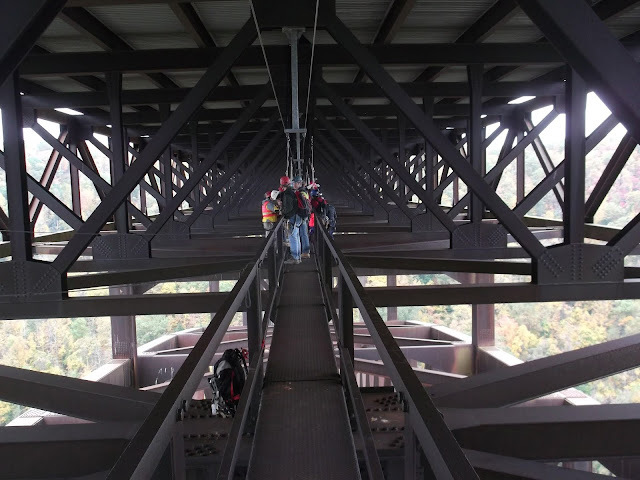 The Bridger Hunter page has comments by Robert Thompson about he and others rappelling from the catwalk under the bridge during the 2014 Bridge Day. He was on rope #5 and descended 825' three times. 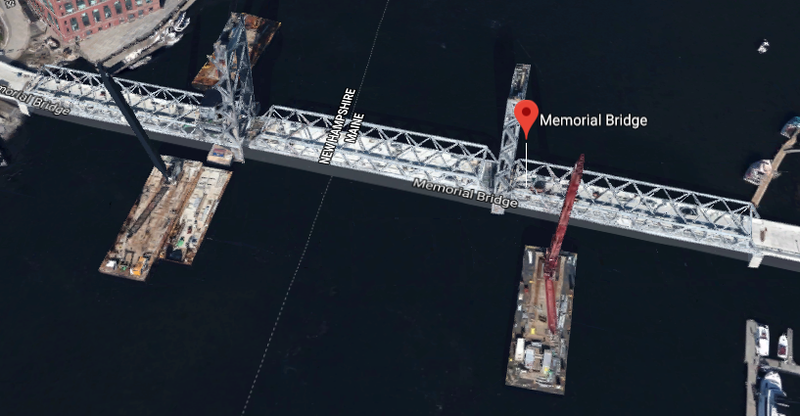 I copied the satellite image because it caught cranes still working on the new bridge. 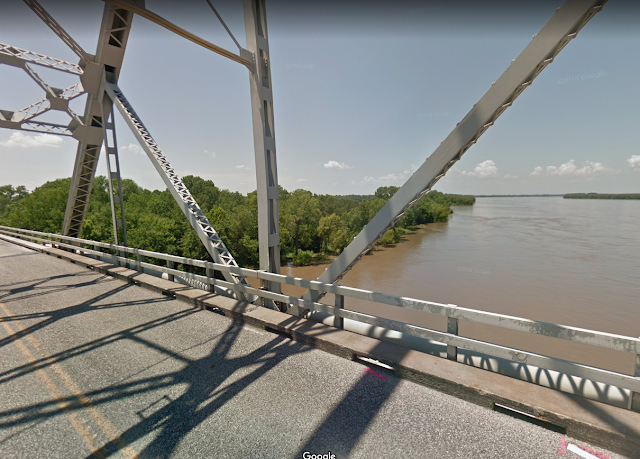 (new window) Watch about a minute to see how fast the river is flowing and how the captain guns the engine (turbo-lag smoke) several times to try to push the towboat out from the bridge. You can see the importance of having watertight doors, and having them closed. The crew saved at least one engine. At 5:27 we can see they brought in a couple of small boats. But evidently they are just assessing the situation. Or did they actually try pulling with the small boat? Skip the people shot and go to 8:29 where we see the arrival of the big tugboat that gets the job done. 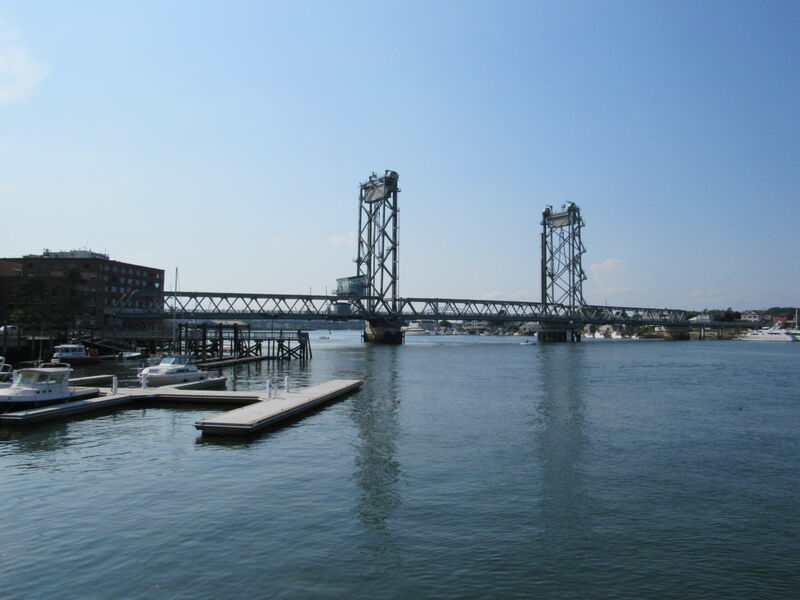 We also see the Sarah Mildred Long Bridge in the background. The tugboat has to be careful making her turn to make sure it also doesn't get caught by the fast river current. At 10:30 is when they actually start pulling on the line. And the line pulls the towboat at 10:40. It looks like the towboat did take in some water because, when it was pulled free from the bridge, it was listing to its port side. 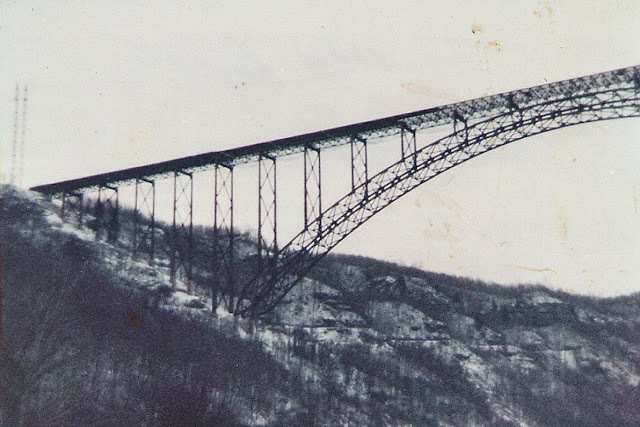 According to Bridge Hunter, the old bridge had a rating of 87.7/100, but they tore it down anyhow! 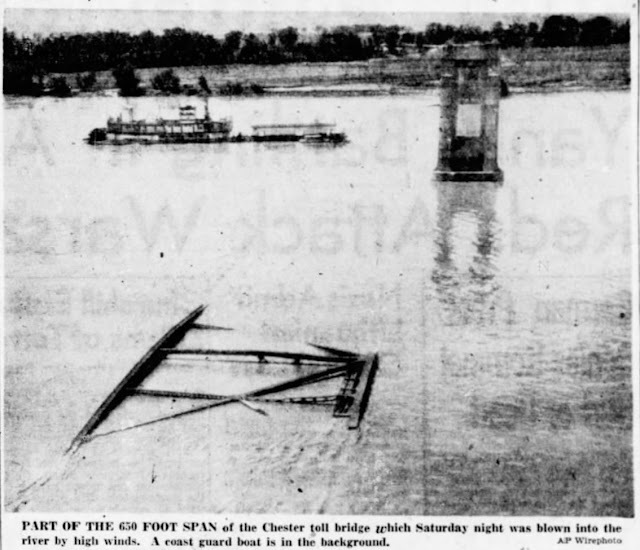 That means they tore down a bridge that was in good condition! One of the I-80 bridges in Joliet, IL, has a rating of 6/100, but it still holds lots of trucks because both BNSF and UP have relatively new, big intermodal yards south of Joliet. 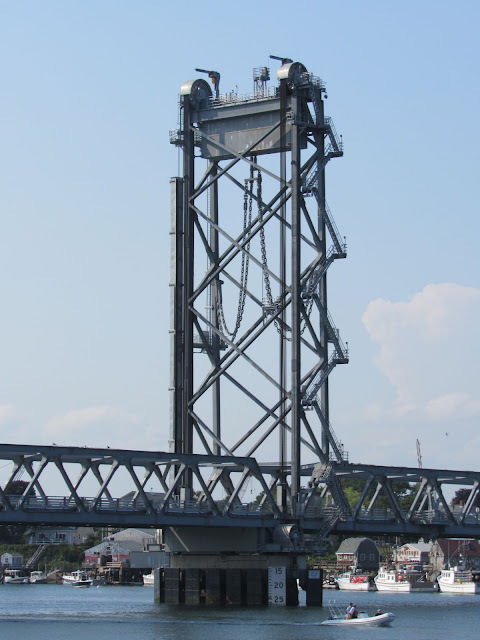 A timeline of the old bridge has 8 images and a video of its construction. 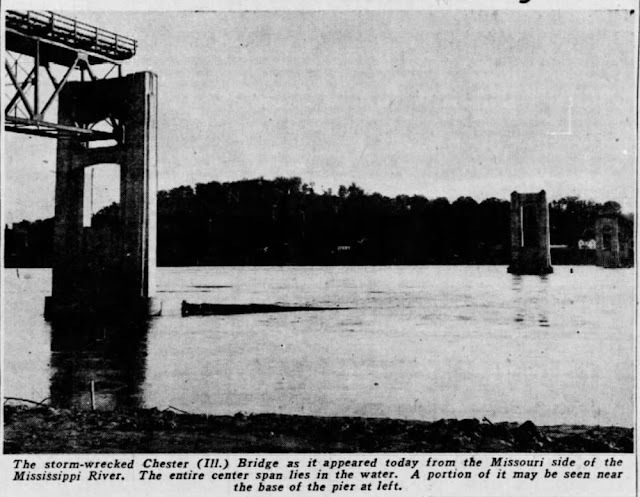 The lift span was floated out just as it was floated in 89 years before. An HAER study was done for the Sarah Mildred Long Bridge, but not for this bridge. Because it was the World War Memorial Bridge, I would think this bridge is even more significant. Note that it was built in 1923, so it is a memorial for WWI. At the time of the construction and naming, no one conceived there would soon be another world war. Sometimes I feel sorry for how blind the general public is to the reality of the bridge world. These people apparently were led to believe that the replacement bridge would look as nice as the historic bridge. Only now, in the end, do they realize their grave error. This project is a perfect example as to why attempting to replicate historic bridges fails. If the community likes a historic bridge, only the preservation of the historic bridge is acceptable. 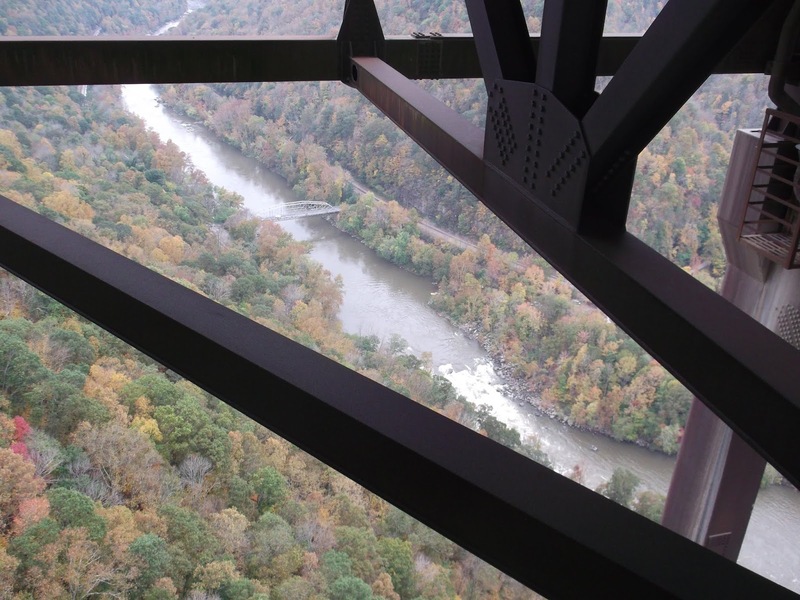 HNTB thinks the replacement bridge is awesome because it is a truss without gusset plates. Great, that just makes the bridge look even more plain and ugly. 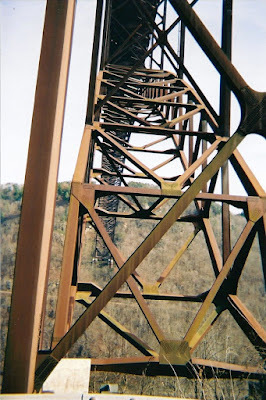 You eliminate rivets, built-up beams, v-lacing, lattice, bracing, and what do you have left? 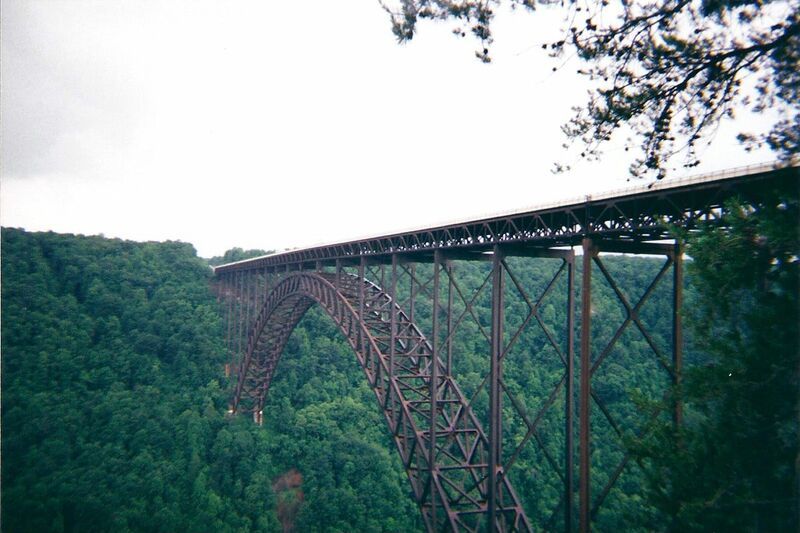 A truss that is what I call a "Toothpick Bridge." 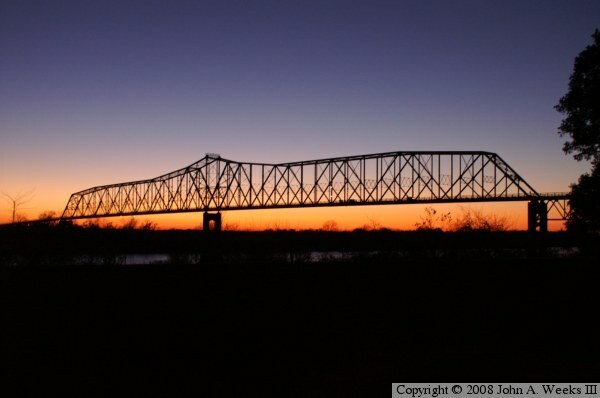 A truss so plain and simplistic that it has lost the qualities that make a truss bridge beautiful.